Age: Children come in many different shapes and sizes–some are larger or smaller than others at the same age. Weight: A tall, thin child can weigh the same as a short, plump child…but they don’t wear the same size. Size: Every clothing manufacturer develops proprietary sizing measurements; sizes in one brand vary from the same sizes in other brands. We always recommend sizing decisions be based on measurements. 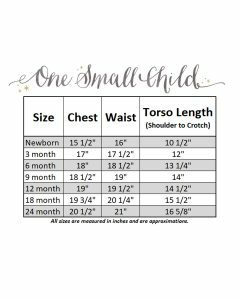 You can trust our size charts and be confident that if you match your child’s measurements to the size indicated on the chart, the item will fit. Our high quality special occasion apparel includes ample wearing room and we don’t skimp on fabric. If you feel you need sizing assistance, you are welcome to email us at [email protected]. Measure your child without bulky clothing. Item-specific size charts are located on each product page. Click the ‘Size Chart’ button just beneath the size selection dropdown to view. Size charts reflect actual body measurements. Our designers have added wearing ease of 1″ to 2″ to the width of the garments to allow for a comfortable fit. The Torso length measurement is taken from the shoulder to the middle of the crotch of a fresh diaper. The finished garment has approximately 1/2″ to 1″ of wearing ease. 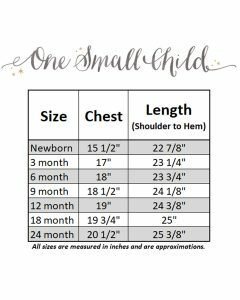 Christening Gown and dress length measurements are as listed on the chart. If your child’s measurement falls between sizes, choose the larger size. Some styles may not be available in all sizes.